MudRunner - American Wilds releases on October 23rd on PC, PS4 and Xbox One, and comes to Nintendo Switch on November 27th! A powerful road-hauler, the Ford LTL9000 is able to move loads like no vehicle before it. If you need to get your logs somewhere, and there's a path to take it, the LTL9000 is a great truck for the job, both fast and dependable. With it's huge 330L fuel tank, and able to take 600 points of damage, the LTL9000 is a truck to be reckoned with, and more than able to hold it's own against other vehicles. With a large add-on complement, the LTL9000 is a vehicle you'll love to use moving large loads across long drives. A heavy vehicle, the LTL9000 struggles off-road, especially with large loads. You'll not be taking this one into the deep water. Great! 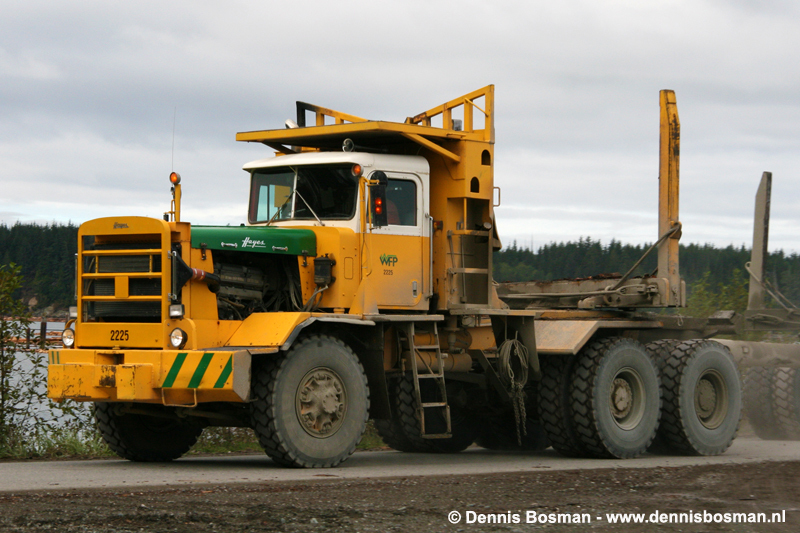 6×4 with diff lock, all logs, huge fuel trailer (4200 as all usa trucks instead of russian 3700). It looks like usa trucks dont have separate garage semitrailer and trailer, and no utility semitrailer and trailer with the fuel. They merged 4 adons into 2 with repair and garage points...i dont know...i will use russian setup for garage, its strange when special VEHICLE constructions like "kung" on soviet chassis or these american "towing vehicles" construction just dissapears to establish garage! When it is container or wagon - its more realistic imho. As for soviet utility trailer - i dont use it, and semitrailer - only to transport jeep in deluge. But now we have flatbed, so its ok to get rid of these two. As for american huge fuel semitrailers (4200 instead of soviet 3700) - do you ever use it in your games? Should probably sticky this as it's very far down on the page currently. @zamal Zamal, come on!..6×6 or 8×8 are too EASY for you and me!)) 6×4 - this is for real game!! and since they are including unlicensed tractors they could include these 3 also. that would really satisfy my hunger and for folks likurself @stazco who are on xbox or ps4 and cant experience mods, would be heavens brought to unholy land to have these in American Wilds!!! I'm with @Stazco on this... we already have a bunch of capable trucks, I'm stoked to see how they balance the new usa maps to use these trucks... and then I'm gonna bury them in the existing russian maps. I have a question, will we get to see the flatbed trailer before the release? I have some ideas for self-made challenges. Pull a loaded truck on the trailer to the drop off point. To tow to garage badly damaged trucks - its great usage. Yes i know, but this would be the first time that the DEVs will make a Model just because someone want‘s it. With a large add-on complement, the LTL9000 is a vehicle you'll love to use moving large loads across long drives......... ??? Long drives ??? Where? What game? Mudrunner ?? In sense of gameplay flatbeds are useless because u can always put utility attachment on truck and repair it, im pretty sure thats the reason they didnt add it all this time, but then pressure got to them cause it was frequently asked and they added it. this whole "American wilds" reminds me to a old topic back at oovee called "American Mud"
where people conplaint about the mud being too thick and slipery and they couldn't blast on it in 2wd no diff lock with their Fords,Chevys and Dodges like they do irl soo i guess they will now get Stuck like in real life because is the only thing i think people would do with these "Wild Beasts" that only have RWD unless this new dlc/game has real "American Mud" like they wanted back in the day or the maps are always paved road with a few gravel off road side trails easy enough to dont get you stuck with the "Wild beasts"